Big thanks for purchasing our CD! Soon to come...Miss LaLa Ladybug T-Shirts! Custom Songs: We also love writing songs just for you! If you are a teacher or a parent, we can create a song for an event, subject you are studying, or as a present for your child. More info and examples here. Since he was a teenager, Jimmy Joe has loved making creations with sculpey clay. 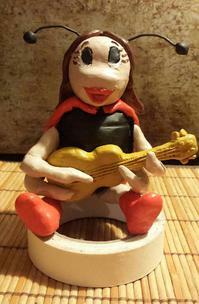 Here are some examples of his creative work, including a wonderful Miss LaLa Ladybug figure. Please contact us if you'd like to talk about a fun custom sculpture.